GoodReads Summary: Perfect for high-energy story times, this cumulative tale is a madcap mash-up featuring robots, shapes in motley amalgamation, and . . . pie! Squares, rectangles, ovals, triangles, and other colorful shapes are sorted and arranged into - two robots! But why stop there? Shape by shape, costume by costume, Robot and Robot play a game of oneupmanship that zips, zooms, and whirrs from friendly to hilariously out of control in nanoseconds. 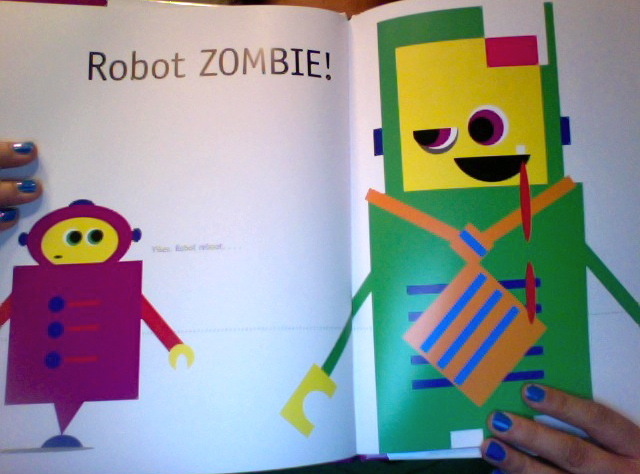 Robot Zombie? How about Robot Zombie Frankenstein? 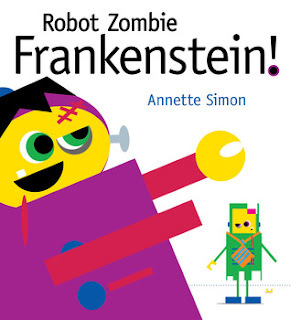 Can you handle Robot Zombie Frankenstein Pirate? What could be next? Where will it all stop? When the race makes a surprise (and delicious) turn, Robot and Robot are happy to be plain old robots - and buddies - once again. What I Think: This book hits so close to home right now because my two sons are starting to develop some sibling rivalry. Peanut will be five in May and Little Bean will be two in July. They are starting to argue over toys or to compete for attention from me and my husband. I can see these robot guys as my sons, trying to always outdo each other! 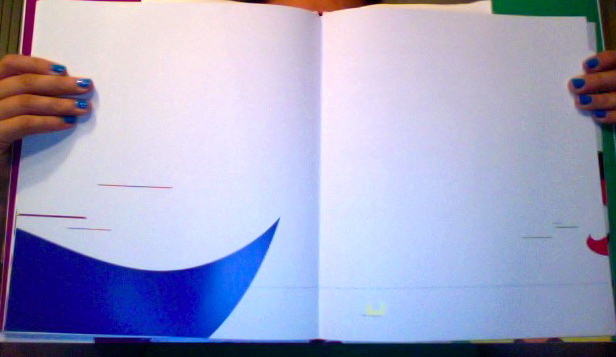 I love how this book easily lends itself to working on prediction. Once kids catch on to the premise that each page turn will bring a new variation on their costumes, it's fun to predict what kind of costume they might change into next. For non-readers or early-readers, this book is also excellent for using the pictures to help us figure out what is happening in the story. I turned a few pages and let my oldest's eyes wander around the picture as he tried to figure out how the costume on this page was different from the previous page. It's so much fun. The repetition of the line and adding on a new costume every time they change makes this a great read aloud. It reminds me of books like There Was an Old Lady Who Swallowed a Fly or Mother Goose's The House That Jack Built except this is refreshing and fun. I know those books can get really lengthy - fast. This book puts a totally new spin on this type of story and it's truly refreshing. The wording is also simple so kids can chime in without having to read the words. I cracked up at the end of this book, too! By the end I was really reminded of Elephant and Piggie books by Mo Willems. I love how the characters play off of each other in those books and how so much is left for the readers to infer. I totally wasn't expecting the ending but I love how simple the robots' antics can be solved. It's clear that they are friends and when it's all said and done, they can go back to being friends again. It's a good reminder that friendly competition is fun sometimes, but that we are all truly friends in the end. I'm thinking this would be a great end-of-the-year read as students in a class become very comfortable with each other and sometimes forget to be nice to each other. Plus, it's a great excuse to get baking and have a yummy snack. Writing Prompts: Draw your own robot and give him a costume. Tell about the robot costume that you came up with. Draw/Tell about a time when you argued with a friend about something - how did you solve the problem?